Wissy's blogspot: The Shah Jahan Mosque. Woking is the home of the Shah Jahan Mosque. 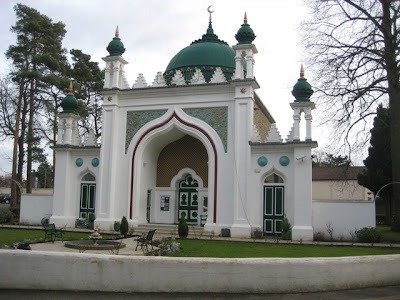 Built in 1889 by the Orientalist Dr. Gottleib Wilhelm Leitner, the mosque was the first purpose built mosque to be built in Northern Europe. Leintner surprisingly, was a Hungarian Jew who as a child had studied at madrassah schools in Istanbul and who memorised large parts of the Quran. Later he worked as an interpreter for the British Raj (he could speak eight languages) and became a Professor at Kings College London before moving to the University of the Punjab. He came back to England and in 1883 began the Oriental Institute in Woking. 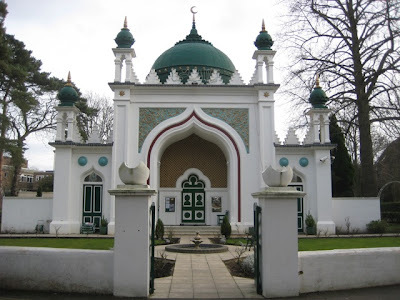 The mosque was built to cater for the worship and spititual needs of the Muslim students at the institute and quickly played a vital role in the establishment of Islam in Great Britain. It also became world famous on account of its publications and missionary work in the early part of the 20th century. 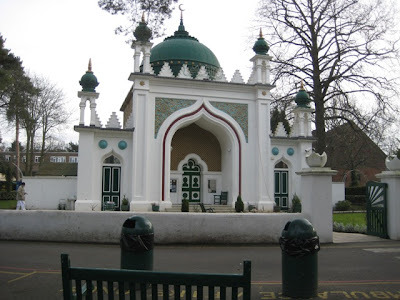 Up until the 1950's the Shah Jahan was the major Islamic centre in the United Kingdom and welcomed famous dignitaries from around the world on official visits, but by the 1960's the mosque's status had declined, and instead served as a place of worship for Woking's and neighbouring Muslim populations. Today, the Shah Jahan mosque is the cultural and spiritual centre for Surrey's Muslims. Hundreds of followers visit the Shah Jahan to pay homage to their faith and to accommodate this, the mosque's 70 person capacity has been supplemented with two nearby prayor halls, which can hold up to 600 people each if necessary. Now a grade two listed building the mosque is very welcomong to visitors and offers guided tours for groups and schools. I think the mosque is one of the most beautiful buildings i have seen. Its traditional Indo Saracen design has a dome, minarets and courtyard. Geometric patterns and Arabic calligraphy are used for decoration. On my recent visit i was unable to go inside the mosque as prayers were almost due to start, but i have been invited back by the very friendly Imam and will do another post with photographs. I can't wait! I ran across your blog because I was researching my grandmother's maiden name of Leintner. Do you know anything more about the Leintner you speak of in your article? Thanks! If you google Gottleib Wilhelm Leitner yyou will get all the information you need. Thanks for dropping by. What a great building to have survived (fairly) well since 1889. I can't tell from the photos how many rooms the mosque originally had and where the new prayer rooms are. The additions must have been beautifully designed to be integrated into the original plan.